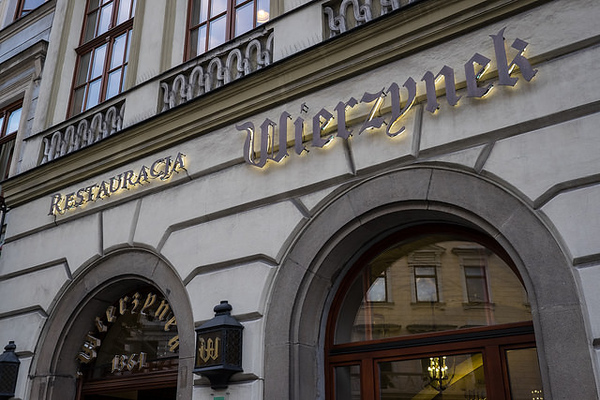 Dating back to the 14th century, Wierzynek is one of Poland’s oldest restaurants and eating here is a real event. The food is imaginative and the venue itself is stunning. Expensive but worth the outlay. On a corner of Rynek Główny, Wierzynek is allegedly one of the oldest restaurants in Poland (est. 1364) and eating here brings a real sense of occasion. The venue itself is the very epitome of luxury and has a superb view if you get the right table. The food is traditional Polish and Eastern European game and fish, with some imaginative presentation, especially the ‘porcini mushroom’ ice cream. This restaurant is in the upper bracket but is probably worth the outlay, as the service is excellent and the list of Polish wines very strong.